Renaissance at Manalapan, located in Monmouth County, New Jersey is an upscale 127-home community built between 2000 and 2001. This friendly community, open to adults age 55 or better, is perfect for the active retiree seeking easy access to the Jersey Shore and Atlantic City while enjoying convenient train service to New York City. Residents can also easily walk to stores and bus transportation. 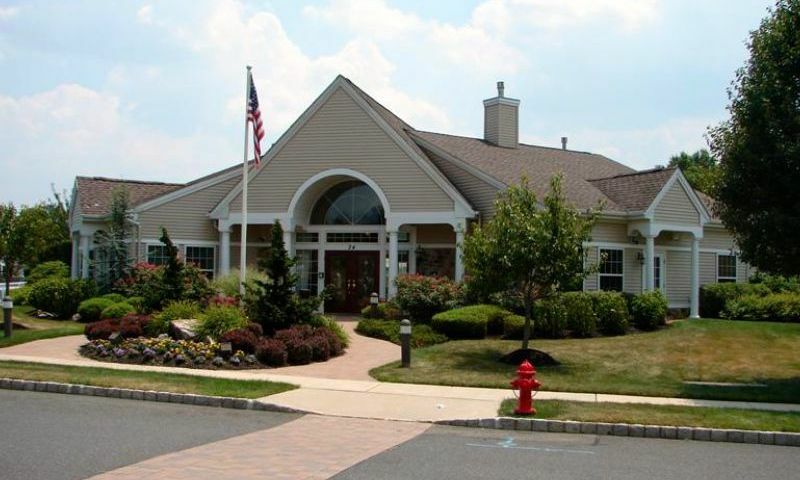 This gated community also provides transportation service to any medical facility or doctor s office in Monmouth County. Renaissance in Manalapan is small on size, but large on social activities and events. On-site, residents enjoy a tastefully designed clubhouse with several amenities to keep active adults busy and social. This intimate community is comprised of spacious single-family homes. Renaissance at Manalapan is an age-restricted community that requires at least one occupant be 55 or older and no one under the age of 19 may permanently reside in the community. The elegant clubhouse of Renaissance in Manalapan serves as a social gathering place. Residents can work out by themselves or in groups at the well-equipped fitness center or relax in the sauna. The cozy library is a great place to relax over a favorite book. The indoor amenities also include a billiards, a card room for individual or group activities, and a ballroom for social events. Outdoors, residents can play tennis, bocce ball or shuffleboard with friends and neighbors or relax in the heated pool. Carlton Homes built Renaissance in Manalapan between 2000 and 2001. All 127 single-family homes are detached. Seven basic models were offered ranging in size from 1,598 to 2,422 square feet. Homes feature two to three bedrooms, two to three bathrooms, and an attached one or two-car garage. Gourmet kitchens, hardwood floors, and room extensions are characteristics found throughout these upscale homes. Some of these desirable residences also include basements, lofts, or both. Residents of this small community like to stay active and welcome new residents warmly. It is easy to make friends in Renaissance, either through the social clubs, attending scheduled events, or simply by going for leisurely strolls around the well-maintained neighborhood. A full-time activities director at Renaissance is on hand to keep the social calendar full, including groups like the men's club, women's club, and the traveling club. Active adults can also explore common interests with their neighbors by joining the billiards group or the cards club. Residents at Renaissance at Manalapan also enjoy a low-maintenance lifestyle with a homeowners' association (HOA) fee that covers maintenance of the grounds, snow removal, trash pickup, and all clubhouse maintenance. Residents can also run errands and go shopping together by utilizing the regularly scheduled community bus service. In addition, there are plenty of cultural attractions to explore in the Manalapan area. Renaissance at Manalapan is located west of Route 9 and is within walking distance to shopping, and within easy driving distance to Philadelphia and Atlantic City via the Garden State Parkway. When Renaissance residents want to go shopping, they are only a few minutes away from the Freehold and Woodbridge malls. For a different type of shopping experience, local farms and delicious orchards can be reached within a few minutes for freshly baked goods and gourmet food selections. Two historic sites worth visiting in Manalapan are Monmouth Battlefield State Park and Covenhoven House. Some of the other noteworthy cultural attractions in the area are the Count Basie Theater in Red Bank, the PNC Bank Arts Center in Holmdel, and the State Theater in New Brunswick. Nature lovers will enjoy visiting Sayen House and Gardens in Hamilton, New Jersey. Residents of Renaissance are within 30 minutes to the Jersey shore and within one hour to New York City. Active adults will love the amenities and small-town atmosphere of Renaissance at Manalapan in Monmouth County, New Jersey. There are plenty of activities available in Renaissance at Manalapan. Here is a sample of some of the clubs, activities and classes offered here. Carlton Homes built Renaissance in Manalapan between 2000 and 2001. All 127 single-family homes are detached. Seven basic models were offered ranging in size from 1,598 to 2,422 square feet. Homes feature two to three bedrooms, two to three bathrooms, and attached one or two-car garages. Gourmet kitchens, hardwood floors, and room extensions are characteristics found throughout these upscale homes. Some of these desirable residences also include basements, lofts, or both. The monthly association fee at Renaissance covers maintenance of the grounds, snow removal, trash pickup, and all clubhouse maintenance. We moved in last summer and really like the community so far. We did some updates to the house (had the kitchen cabinets refinished, put in new granite countertops and new carpet). We'd like to redo the master bath but that's going to wait until Spring. In my opinion the clubhouse is nice and is maintained well. It's always clean and tidy. I use the pool and the fitness center the most out of everything. Having a gated entrance is also very nice. It keeps the community private and feels more safe. Another thing to note is the community is very pretty. There is a lot of nice landscaping and large trees. 55places.com is not affiliated with the developer(s) or homeowners association of Renaissance at Manalapan. The information you submit is distributed to a 55places.com Partner Agent, who is a licensed real estate agent. The information regarding Renaissance at Manalapan has not been verified or approved by the developer or homeowners association. Please verify all information prior to purchasing. 55places.com is not responsible for any errors regarding the information displayed on this website.